Addressing a press briefing on the state of the nation in Lagos state, Founder of the Pan-Yoruba group, Oodua Peoples Congress (OPC) and National Chairman of the Unity Party of Nigeria (UPN), Dr Frederick Fasehun has called for the proliferation of security agents around Vice President Yemi Osinbajo, as his life could be in serious danger. 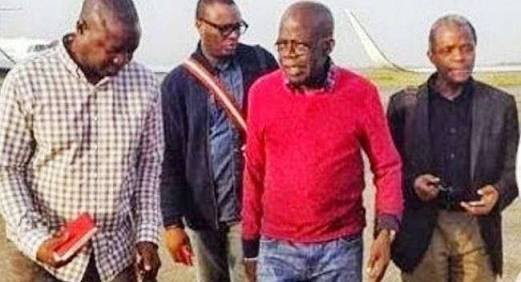 As an observation made, The Odua people Congress leader stated this in expression of fear over the manner in which Osinbajo’s security was handled during his visit to Benin, Edo state recently. According to the Yoruba leader, "Security lapses occurred during his visit to Benin, Edo State, when a young boy beat the cordon around His Excellency to steal a handshake from him. Viewed critically, the incident highlights a security breach a bomber could easily exploit.” Frederick continues, "His handlers must take his personal security more seriously. Nothing must happen to Acting President Yemi Osinbajo. God forbid that he should be the object of any attack, it will spell doom for this country because then you can trust the Yorubas and the South West to make both the blood of the dogs and the baboons really, really bloody,” This call by the OPC leader was made on Monday, stressed on the need for the uncompromising of the security around the Vice President. He said the vice president’s security handlers should be more alert and alive to their responsibilities.